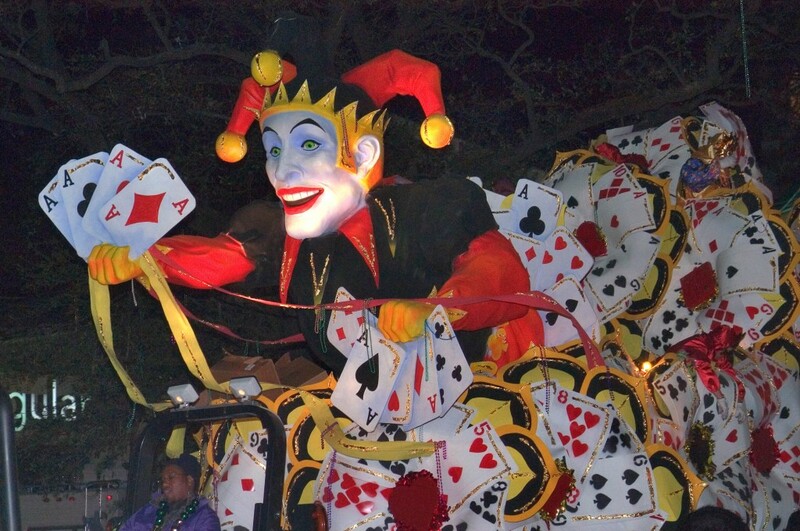 PROTEUS & ORPHEUS ROLL ON LUNDI GRAS!! 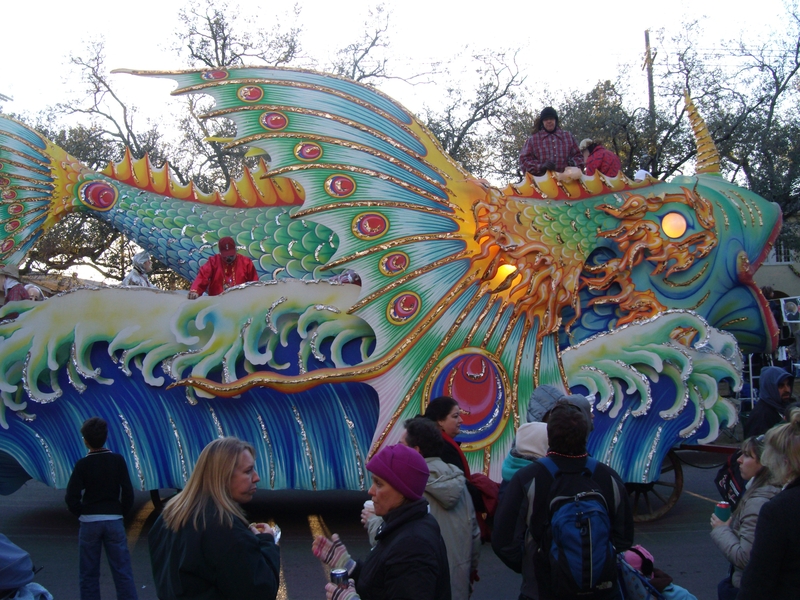 Proteus is the Second oldest Parade at New Orleans Mardi Gras. Founded in 1882, Proteus (“PROH tee us”) The shepherd of the Oceans, is an early sea-god, one of several deities whom Homer the Old Man of the Sea has always held elaborate masked Tableau Balls and the most beautiful Street Parade to date. 2009: Joan Rivers, James Belushi, Reno 911! 2007: Patricia Clarkson, Sean Payton, Harry Connick, Jr.
2003 Travis Tritt, Harry Connick, Jr.
1997 Stevie Wonder, Quincy Jones, Anne Rice, Harry Connick, Jr.
1996 The Road Rules gang from MTV, Laurence Fishburne, Jay Thomas (’96 King of Orpheus), Anne Rice (’96 muse of Orpheus), Harry Connick, Jr.
1994 Little Richard, Branford Marsalis, Vanessa R. Williams, Dan Aykroyd, Harry Connick, Jr.
Other celebrity monarchs for the Krewe of Orpheus include Camryn Manheim, Debbie Allen, Tommy Tune, James Brown, David Copperfield, Delta Burke, Gerald McRaney, Josh Gracin and Christian LeBlanc. LONGEST PARADE DAY IN MANY YEARS BEGINS!! Web cam on Bourbon St. located at Tropical Isle!! 5:22 & Bacchus is nowhere in sight. WDSU’s Parade tracker is still messaging me about Thoth. 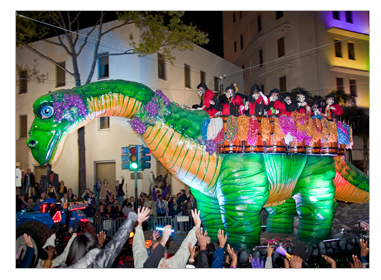 Time flies when you have 5 parades in a row, including two very very large Super Krewes ending up the whole shebang! 5:36, Bacchus is rolling, according to WDSU-TV’s parade tracker service. Endymion gave up its beloved Canal Boulevard route for the traditional St. Charles Avenue. They will follow Bacchus for a very long day of parading, starting with Okeanos, Mid-City, & Thoth! Thoth runs a long route, and takes over 3 hours to run. 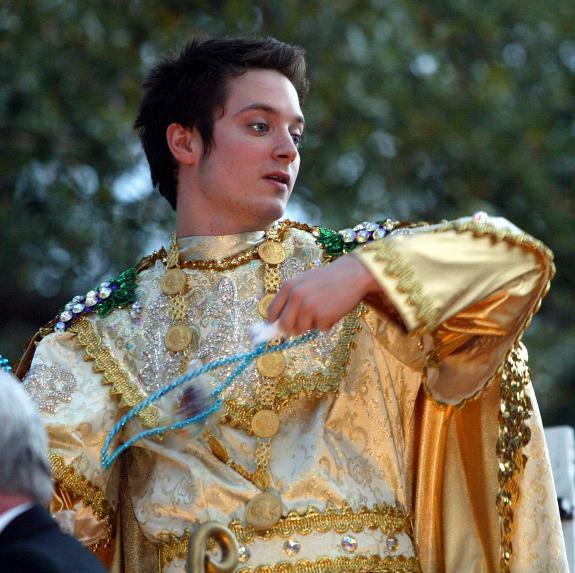 If Bacchus starts roughly at 3 pm, Endymion can begin at Bacchus’ old time of 5 pm. Then the night wouldn’t run by very much, if things go smoothly, which they probably won’t. Without being unduly pessimistic, the parading night with probably run into the wee wee hours of the night!! 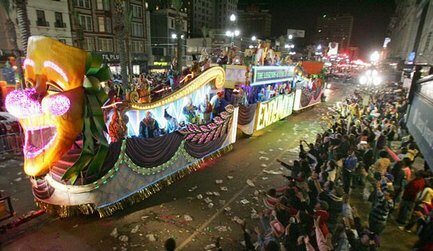 This is the 2nd time since Katrina (2005) that Endymion has changed routes and it’s not very popular with the legions of Mid City Endymion fans that LOVE the 1 major parade that doesn’t go down St. Charles Avenue! Plus, a ton of businesses count on the Endymion business boost their business through the roof temporarily. Okeanos has begun, as has Mid-City. Thoth will follow, then Bacchus and Endymion. The longest parade day in recent history is underway! 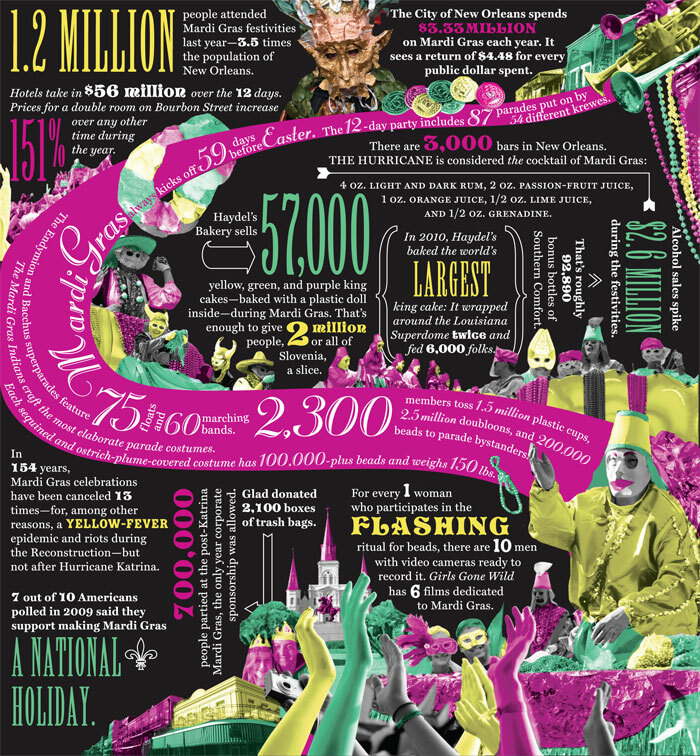 Endymion is arguably the largest krewe in the whole New Orleans Mardi Gras, and to roll last after Okeanos, Mid-City, Thoth, then Bacchus before starting must have been quite a blow of weather reality to swallow. As it’s pouring at 1:30 pm a few hours before Endymion was supposed to roll, it looks like the move to skip a day was wise. Only tomorrow will tell, but from today’s downpour, it looks wise indeed. You never saw so many groups of a dozen or more, all with big labels, CITY OF NEW ORLEANS, and at least 3-4 groups of toilets between St. Charles Avenue and Annunciation Avenue. Big change and very welcome! 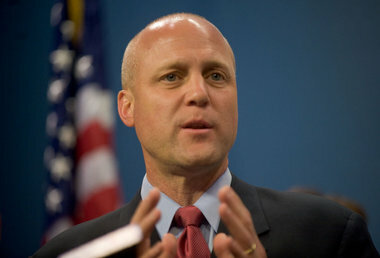 Thanks to the City of NOLA, the Mayor of NOLA, the City Council of NOLA, and sanitation of NOLA. No private Port-o-lets were removed along Napoleon Avenue as of 9:30 pm on Saturday, March 5. CITY TO REMOVE PORTABLE TOILETS FROM NEUTRAL GROUNDS!!! Saw the mayor, police chief, etc. 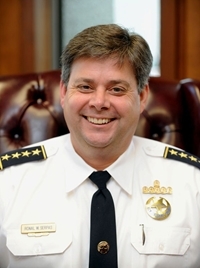 talking on TV tonight about the removal of all port-0-lets from the neutral grounds that are around the St. Charles Avenue, Napoleon Avenue, and Canal Street for Endymion. This is no new tradition. 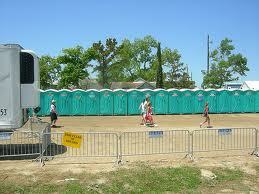 Many of the families around the parade routes have been paying for their own Port-o-Potties for decades!! Whole families and groups depend for decades on this relatively unobtrusive, since they appear and vanish within 10 or less days without fail. I do not think the Mayor or Police Chief are using the right logic in carrying out this decision without any public opinion sought. I wouldn’t be surprised if the City Council revisits this ban very quickly. What’s the deal here? Has the city been paying for the Port -o- Lets on the neutral grounds? The answer is NO NO NO!! So what is really behind this decision? Right Aid at St. Charles and Louisiana Avenues have a dozen port-0-lots available. They are free for cutomers, and $2 for everyone else, and the money aids the New Orleans Musicians Clinic! My group usually hang out on Napoleon Avenue around Coliseum Street. Sophie Gumbel School offers clean bathrooms very cheaply. The fees benefit the school. $5. per day per person as many times as you like. $2. for single usage. A great deal! !